The blowout that blew me away. 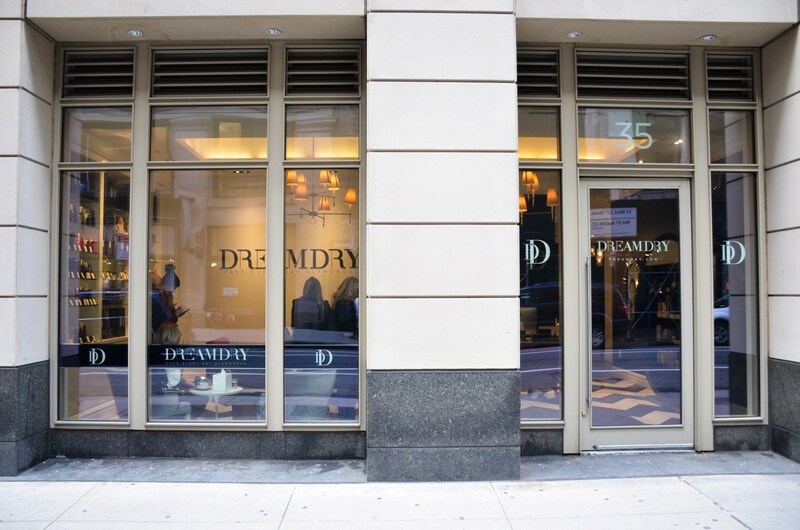 Quick digression from all my NYFW posts to put the spotlight on one of New York’s chicest blowout bars, DreamDry. I’ll start by mentioning that I guard my hair like a momma bear to her cub. There have been one too many instances where I’ve walked out of salons feeling multitudes of regret, and any time I’ve had to go to a girl’s girl for an event, I’d end up redoing my hair myself. My hair is pretty unmanageable, tedious, and disastrous, so I get it if your years of experience still can’t tame this lion…I’ve got 20+ years nailing my hair routine down to a science. But hey, I’m all for trying new experiences, and if you throw some of my Style Collective sisters in the mix, I’m there. This salon was top to bottom sparkling with sophistication like its co-founder, Rachel Zoe. Greeted with some bubbly (helpful in calming my hair-phobia nerves? ), my miracle hairstylist, Bricel, walked me over to the wash room. I didn’t see this part coming–the whole process of washing my hair was almost like an art form complete with a scalp massage! I’ve never experienced that before, but it really does set the foundation for the whole experience. You get to choose different hairstyles (my stylist mentioned the most requested right now is the Stevie.) I loved the end result, and I think next time I’m back I’ll have to try their creative braid designs! The best part about my experience was warning Bricel about my hair and finding out her hair is just as curly as mine! She walked through every product she was using on my hair and suggested new ones for me to look up when I got home. I almost couldn’t believe that she was able to tame my mess (without a straightener or curler) all with blowout and a few products. It was also fun to catch up with my SC ladies while sipping on champagne. Thank you, DreamDry, for taking care of us! I’ll take experiences over things any day, and this one was one I’ll always remember. My only caveat is that there is no location in Los Angeles. However, they said they’re announcing some new spots in Spring 2017; let’s cross our fingers! *To all my NYC readers, there are two locations for you to try: Flatiron (the one I visited) and Columbus Circle. The two other locations hold stake in Chicago and Atlanta.